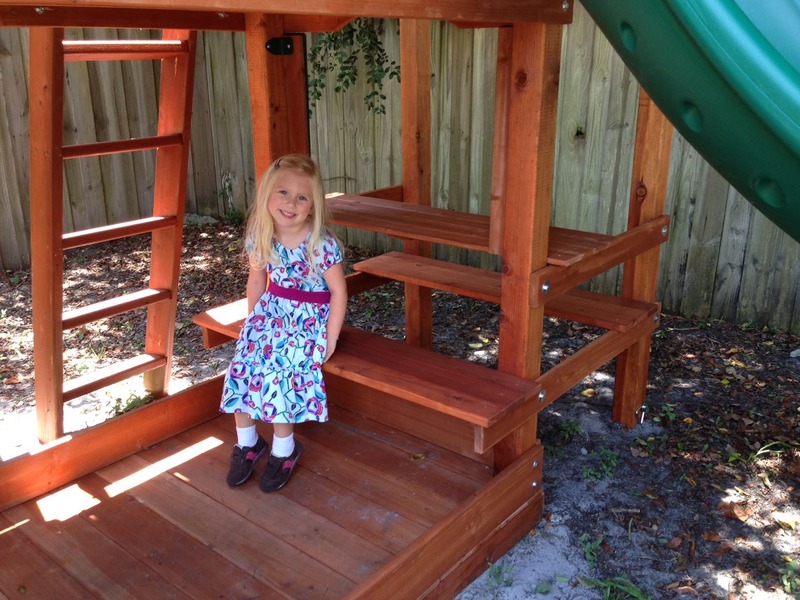 TRADITIONAL WOODEN SWING SETS BUILT TO LAST A LIFETIME! Excellent service and product! I highly recommend and so does my 4 year old! 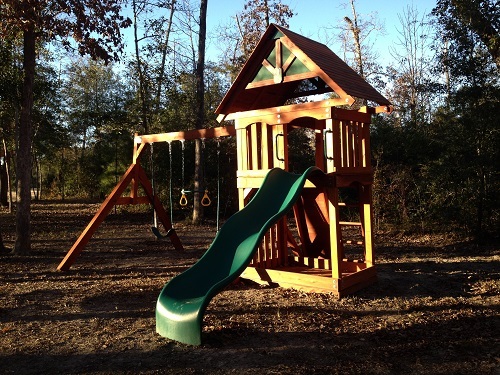 West Texas Swing Sets has quality swing sets at reasonable prices. 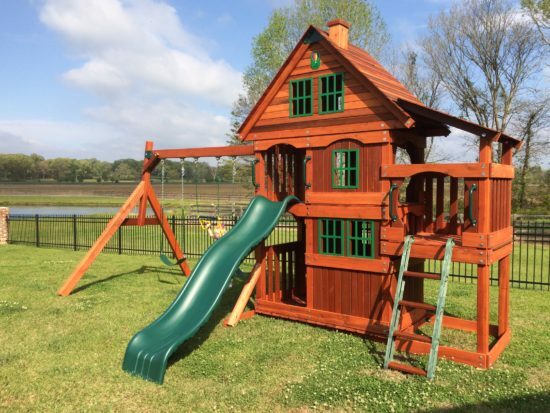 I bought the redwood and cedar swing set about 2 weeks ago and asked that it be delivered on a Friday so I had the weekend to put it together. 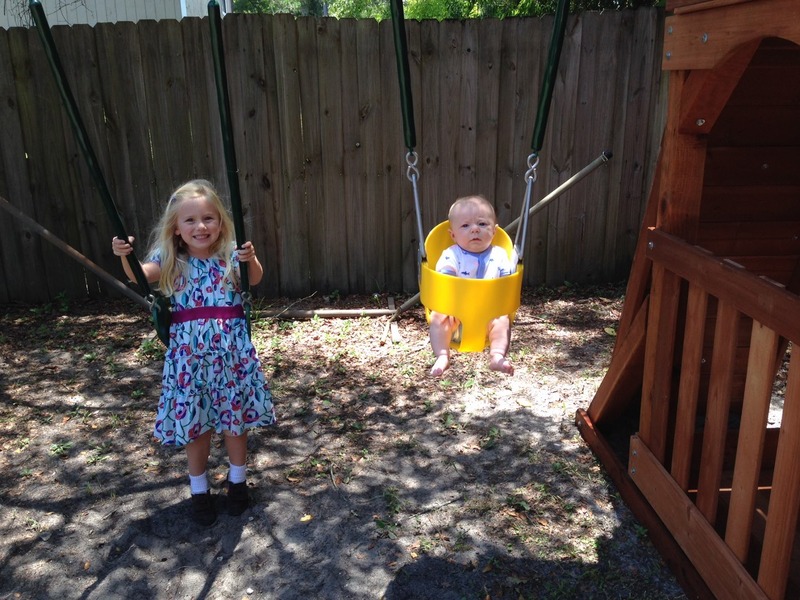 It is the perfect space saver swing set that fits my small backyard and it arrived right on time. I thought I would have some help but ended up putting it together myself. That hardest part was putting the redwood swing beam in place by myself. Most swing sets have one height for the beam and too bad if your yard isn’t level. West Texas Swing Sets are made so the swing beam height is adjustable and I was able to put it together perfectly level without shims even though I was almost 4 inches out of level end to end. It took me about 5 hours without the slide.I bought the turbo slide and it took extra time to build it. The week earlier I helped my son-in-law build the one he bought from Sam’s Club or Costco and the directions said 2 men 36 hours. It took us the better part of 3 days to build it. 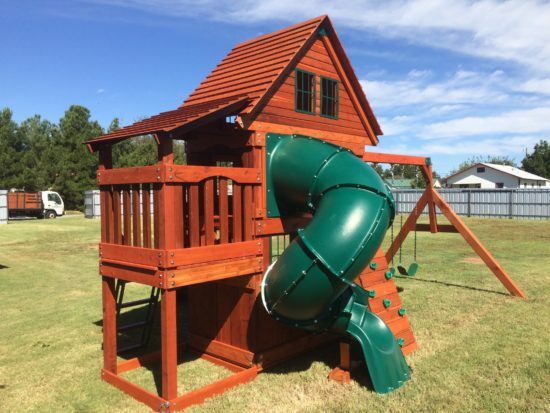 My West Texas swing set is better quality and took less than a day to build because it comes with most of the pieces like the ladder, rock wall, swing hangers, and main tower already put together. 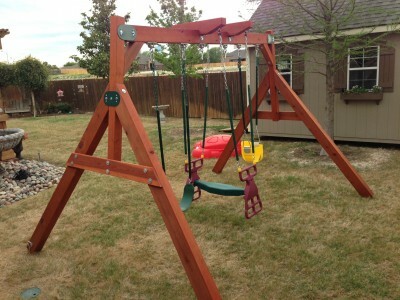 If you are looking for an easy swing set project with high quality parts I highly recommend West Texas Swing Sets. 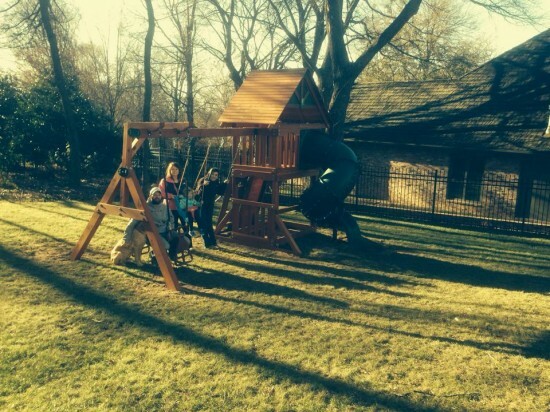 So impressed by the quality of the swing set we just had installed in our backyard this morning! Matt and Elizabeth are such a sweet young couple and provided us with exceptional customer service. We will be back to purchase a fort when our little one is a little older. Very, very pleased!! Great quality and Charlie was a phone call away and very helpful with questions when it came to assembling it at my home in Tulsa. My grand daughter loves it. 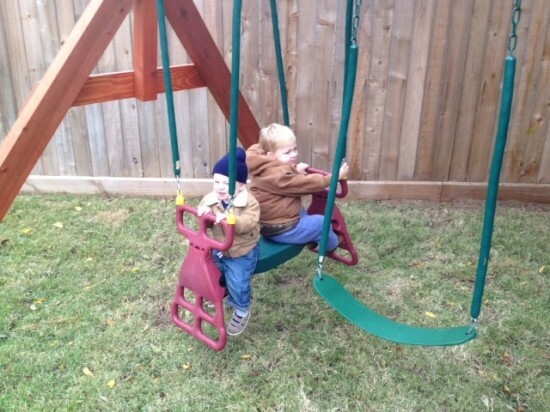 West Texas Swing Sets delivered what they promised, a high quality and sturdy set. 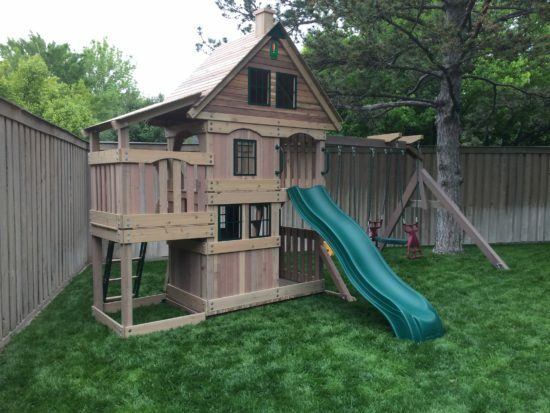 The assembly took my son and I a couple of days mainly due to having to level my ground as we installed in a slope, and I also ordered the turbo slide which adds significantly to the install time but was well worth it. I highly recommend this set and this fine company. Charlie, got it installed before Christmas and all seems fine. You may be getting some more business from people we know. My dad bought us a package 3 swing set as a surprise for our new baby girl and her 3 year old big sister. I can’t think of a better gift because we are out there almost everyday sunshine or snow. It only took a few guys and a few hours to completely set it up, and it is just so much fun and is so beautiful! The view from inside my house to our backyard is a major upgrade 🙂 Thank you so much for making such a beautiful and fun swing set! My daughters love it more than anything else they own, and I love that it is strong enough for me to play on it too! Thank you Thank you! I wanted to thank you for an absolutely seamless project. Every aspect from purchasing, shipping, to assembly was a piece of cake. My father, 3.5 year old son (clean up man) and I were able to put it together in just over 3 hours. Steps and instructions were well laid out and very easy to follow. Both my boys have spent all week playing out there. It will be hours of enjoyment for the whole family. 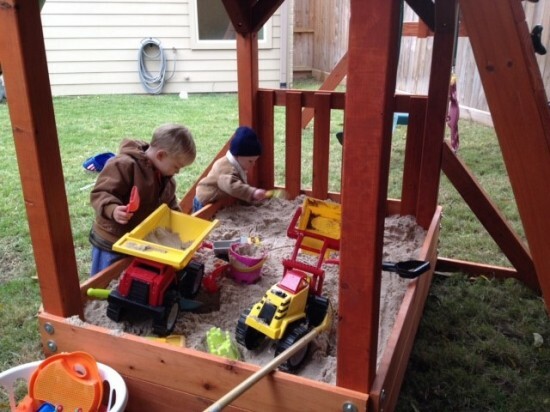 Thanks again for giving these two brother’s a great play set to enjoy! Visit our Facebook Page to view more Reviews! Also, each location has a Google+ Page. View Reviews here also! 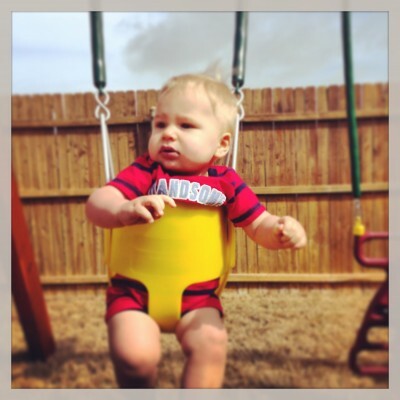 Amarillo Google+ Carrollton Google+ West Texas Swing Sets is a family owned business who takes pride in our Texas Wooden Swing Sets.